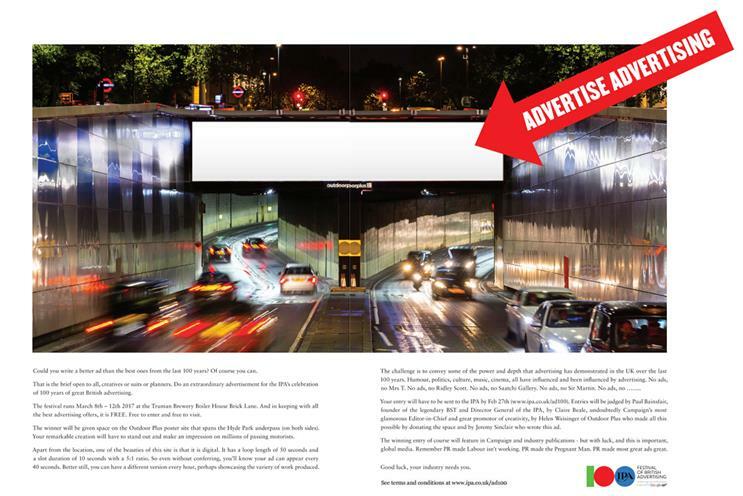 The IPA has launched a competition to win £50,000 worth of advertising space on one of the most prestigious outdoor sites in the UK: the 14.4m x 2.9m digital screens spanning both sides of the Hyde Park underpass. The winning ad will promote the IPA’s Festival of British Advertising, which takes place largely at the Truman Brewery Boiler House on Brick Lane, from 9 to 12 March. The festival will include an exhibition, which is free, and a series of events that are ticketed but open to the public. The competition marks the 100th anniversary of the IPA's founding . Information on how to enter is available on the IPA's website and entries are due by 27 January. The ad promoting the competition in this week's Campaign incorrectly states the closing date as 27 February. The winner will be announced on 9 February and the winning ad will run in rotation for seven days, from 6 to 12 March, appearing for 10 seconds every 50 seconds. There is also the option to show a different version every hour. The ad space has been donated by Outdoor Plus, which owns the site. The brief is to "advertise advertising" by drawing on the best ads of the last century to drive home the power and significance of the medium. Bainsfair said the idea behind the festival and competition was to make the case for the significance of advertising in both influencing and reflecting all aspects of life. "We wanted to look at the effect that advertising has had on culture, society, the economy – pretty much everything," he said. "It’s reach is extensive. Sometimes people think of advertising as being a bit of a side show to the real business of the country, but wherever you look, you can’t go far without finding it." Aside from attracting visitors to the exhibition, Bainsfair said the initiative aimed to promote advertising as a job. "A lot of the most outstanding ideas people have come from unexpected backgrounds," he said. "We wanted to reach out to all sorts of people and encourage them to consider a career in advertising." A Q&A with Alan Parker on his transition from making ads to feature films, followed by a screening of his first film, Bugsy Malone.